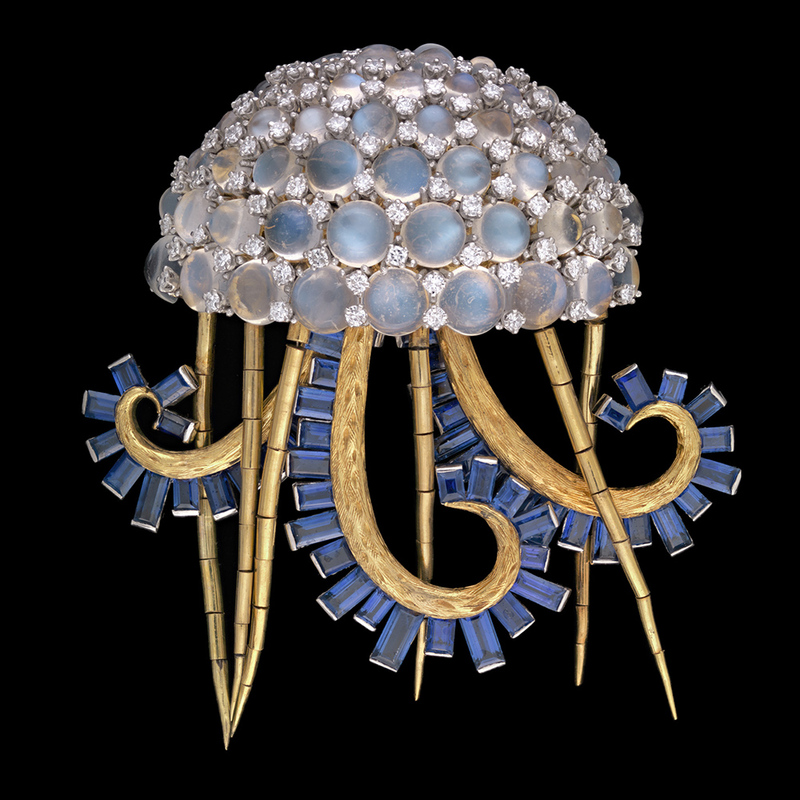 A jellyfish brooch with moonstones, diamonds, and sapphire tentacles, a bejeweled sunflower standing in a little terracotta pot enlaced with gold, a butterfly bracelet with amethysts, sapphires, turquoise, peridots, and diamonds, a small bejeweled gold bird standing atop a giant Lapis, Jean Schlumberger’s creations are whimsical dazzling interpretations of nature in movement that epitomized mid-20th century chic. During his lifetime, Schlumberger’s elegant designs found favor with celebrity clients such as Audrey Hepburn and Elizabeth Taylor, as well as wealthy patrons like Jacqueline Kennedy and her close friend Rachel Lambert Mellon, the wife of the great art collector Paul Mellon. When Mellon died in 2014, she bequeathed, amongst many other treasures, her entire collection of Schlumberger jewelry and objects to the Virginia Museum of Fine Arts in Richmond, Virginia, which now holds the largest and most comprehensive public collection his pieces. The museum recently opened a new exhibition, The Rachel Lambert Mellon Collection of Jean Schlumberger, that showcases over 140 of the jewelry designer’s creations, ranging from cigarette cases to statement necklaces and iconic bracelets. Schlumberger’s costume jewelry creations, using porcelain flowers mounted as clips, first caught the eyes of Parisian couturier Elsa Schiaparelli for whom he worked in the 1930s, creating novelty buttons. He rejected the geometry of the prevailing Art Deco style, and favored a more sculptural approach. Some of his early iconic designs included a gold cigarette lighter in the shape of a fish with a flexible tail, and the 1941 Trophée de Vaillance brooch (a complex sculptural pieces with amethysts, rubies and diamonds) created for the Vogue editor Diana Vreeland. Schlumberger moved to New York after World War II and opened a small boutique with Nicolas Bongard, a childhood friend and nephew of couturier Paul Poiret. 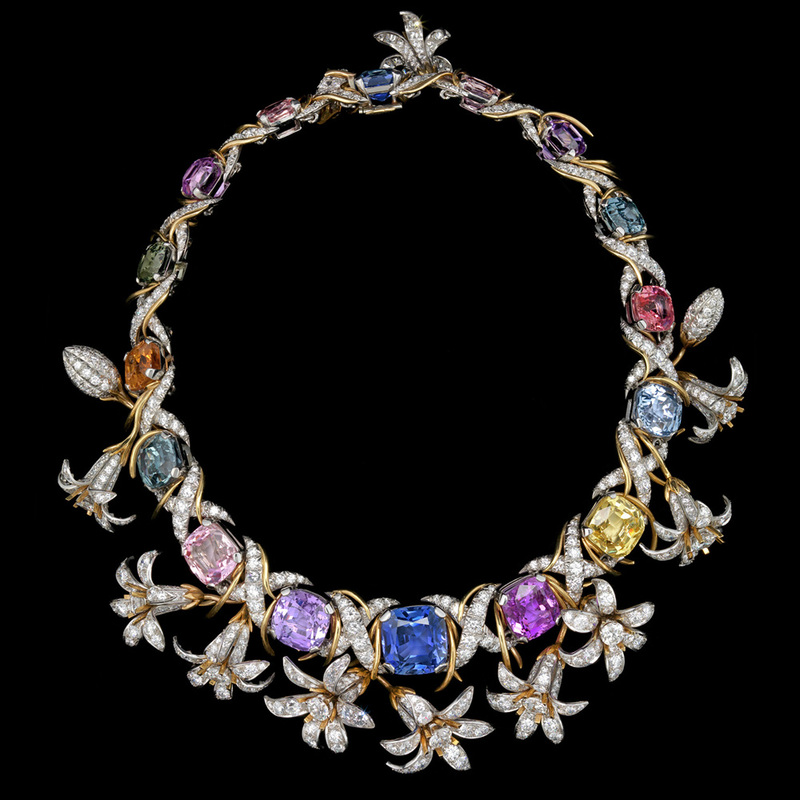 The two men joined Tiffany & Co. in 1956 where Schlumberger was able to freely unleash his creativity while having access to an unlimited supply of the great colored stones. One of his favorite themes was the sea, and the jeweler created countless sea urchins, fishes, cockleshells, starfish, and sea anemones, many of which are on display at the Virginia Museum of Fine Arts. He reintroduced the art of paillonné enamel (layers of translucent enamel over tiny pieces of gold or silver, known as paillons) and his gold ribbed and enameled bangles, stabbed with gold nails or studs, remain popular today. Although Schlumberger died in 1987, his department at Tiffany’s Fifth Avenue store continues to create his designs in limited quantities. He is one of only four designers to have ever been allowed to sign his work at Tiffany.